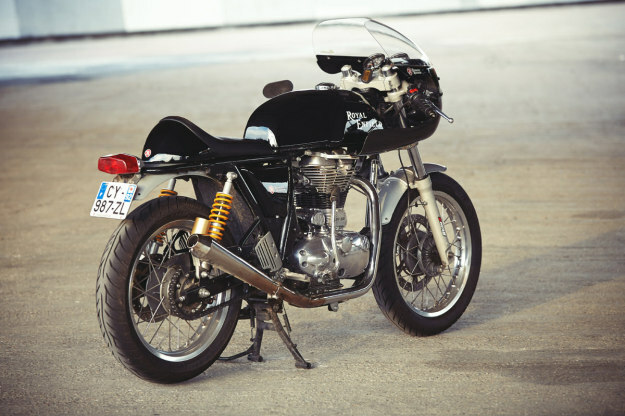 With just 29 horses on tap, the Royal Enfield Continental GT is not the most likely of racebikes. But what it lacks in power, it makes up for in old-school charm. 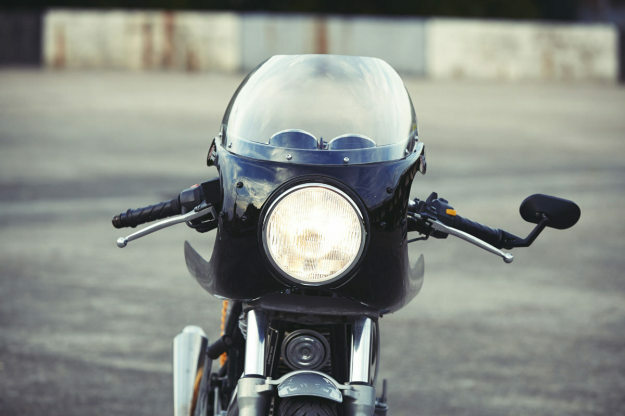 Fresh from the factory, the GT is a dead ringer for the home-built cafe racers of old, in a more modern package. Sure, the bike is a little outgunned by today’s standards, but it has potential—as the French RE dealer Tendance Roadster has just shown. 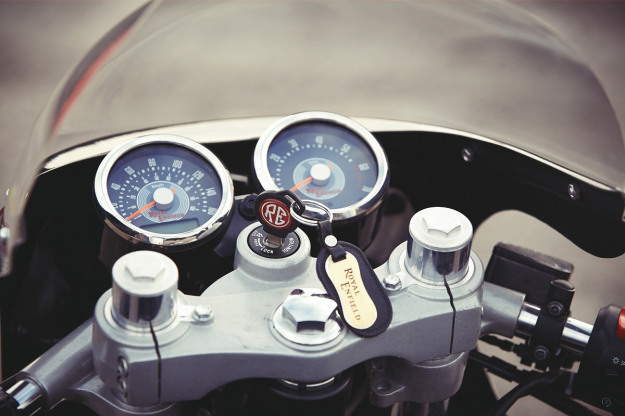 Tendance boss Guillaume Tiraud is a fan of the Iron Bikers races, held on a circuit near Paris. 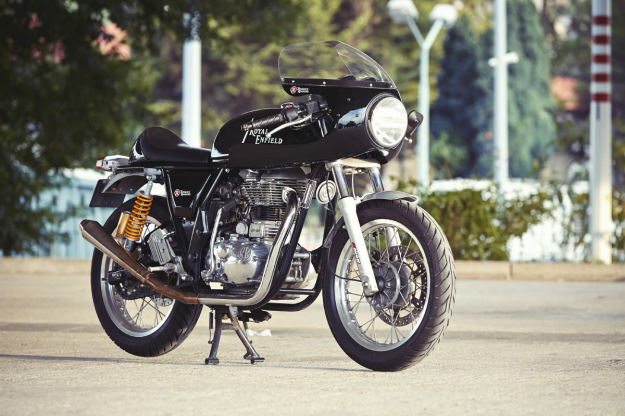 Fleets of Royal Enfield Bullets battle with 1950s Norton Manxes, BSA Goldstars and Matchless G50s. In the handling stakes, Guillaume is pretty chuffed with the stock Continental GT frame, which was designed by Harris Performance in the UK. “It’s just perfect for race use.” he reckons. “Precise and easy to handle.” The Paioli gas-charged shocks, Brembo brakes and Excel rims help things along too. So Guillaume decided to transform his run-of-the-mill GT into a race bike. Starting at the front, he took a Norton Manx fairing and reshaped it to fit, via a custom-made stainless steel bracket. He then installed a new set of clip-ons that sit much lower than the stock setup. You can get the conversion in kit form, at a cost of EUR845 (around $1,000) and installing it is a four-hour job for a home mechanic. The engine desperately needed a boost, so Guillaume has also upgraded the camshaft and valves, and remapped the fuel injection. 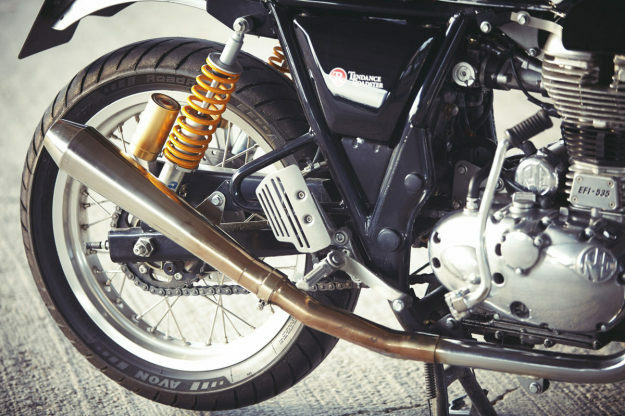 A stainless steel exhaust system gives a little extra kick. Guillaume’s named his GT “Vitesse”—French for “speed”—and reckons it’ll be the fastest bike in its class at the Iron Bikers events next year. If you’ve got a Continental GT in your garage—and why not, it’s only $7,200 brand new—we reckon the Tendance Roadster kit is a bargain. 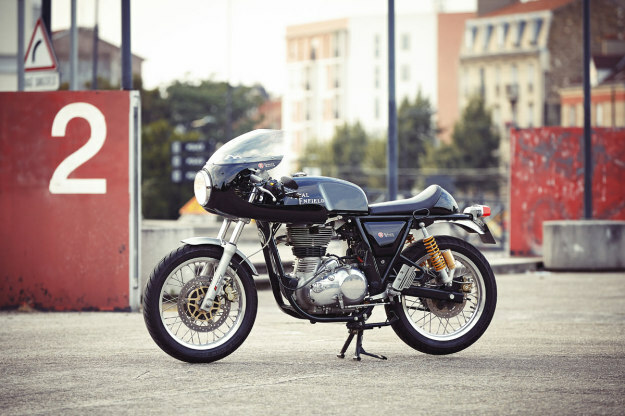 Is it enough to tempt you into the Royal Enfield fold? Tendance Roadster website | Instagram | Facebook | Images by Daniel Beres.